“Garbanzo Beans” or “White Chickpeas” are very popular in Indian Cuisine. Who can forget North Indian dishes like Chola Battura, Punjabi Chola Masala, Pindi Chana or the ever popular South Indian street food – Kadala Sundal. Black Chickpea (Bengal Gram) is more commonly used in South Indian dishes like Kadala Curry. Kabuli Chana is a great source for vegetarian protein. Those of you who are avoiding fish and meat for Lent can use Chickpeas in their diet. 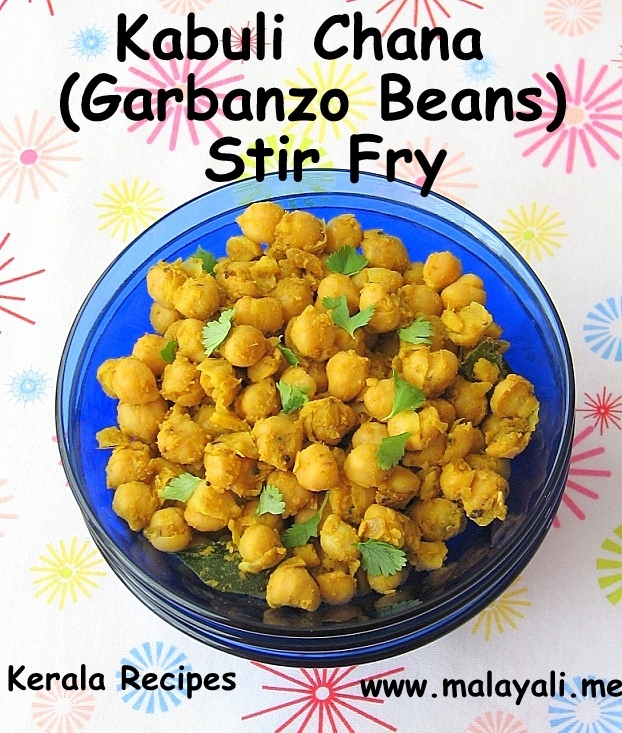 Here is the recipe for a simple stir-fry using Kabuli Chana (Chola). I have used North Indian spice powders in this recipe for a distinct flavor. I usually boil chickpeas and refrigerate it for a few days. 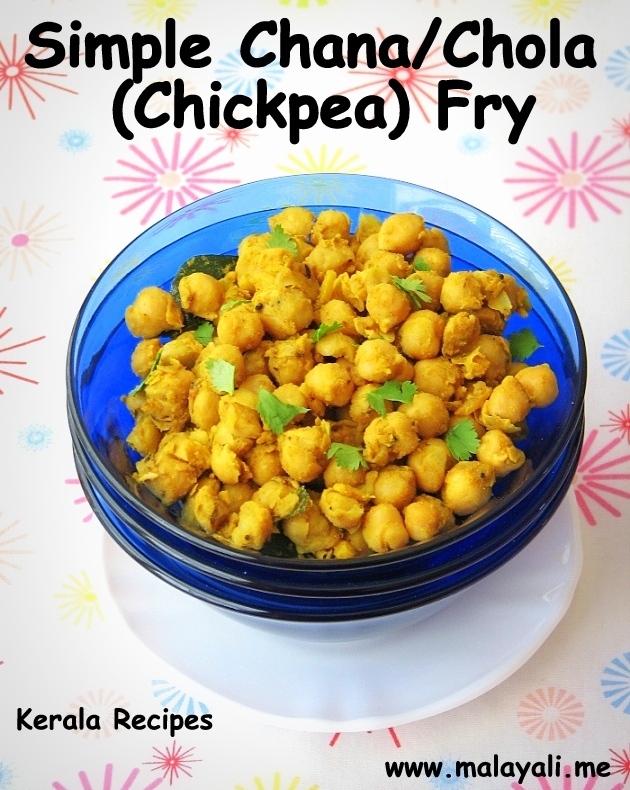 When I need a quick side dish, I use these chickpeas for making a stir fry. Soak the Chickpeas in plenty of water for at least 8 hours or leave it overnight. Wash and drain the chickpeas. Pressure cook the chickpeas with 6-7 cups of water and salt to taste for around 15 minutes (4-5 whistles) on medium heat. You can add a bay leaf and a few garlic cloves while cooking the chickpeas to reduce the digestive problems caused by legumes. I have found this to be very effective. Once the pressure has subsided, drain the chickpeas. Discard the bay leaf and garlic cloves. Heat 1 tbsp oil in pan and splutter mustard seeds. Add the onions and curry leaves. Saute until the onions begin to brown. Throw in the minced ginger and garlic. Stir fry for a minute or two. Reduce heat and add turmeric, red chilly, chicken masala, dried mango and chaat masala powders. Stir fry for a minute and add a few tablespoons of water to the pan along with salt to taste. Saute the spice masala until fragrant and oil begins to release. Add the drained chickpeas to the pan and mix everything. Stir fry for 4-5 minutes mashing a few chickpeas in between. Remove from stove top and sprinkle lemon juice as needed. Garnish with finely chopped cilantro. For a quick fix, you can use Canned Chickpeas for this recipe. Very healthy recipe and easy too..